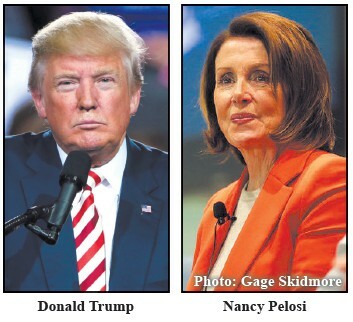 President Trump and House Speaker Nancy Pelosi (D-Calif.) both vowed last Tuesday not to yield in a standoff over border wall funding that has led to a partial government shutdown now over one month old. Trump accused Democrats of playing “political games.” In a tweet Trump posted he exclaimed, “No cave!” and argued that construction of a wall along the Mexican border would lead to substantially lower crime rates and fewer drugs coming into the United States. Pelosi’s response accused Trump and Senate Majority Leader Mitch Mc- Connell (R-Ky.) of “holding Americans hostage” by not acting on bills the House is passing that would reopen government departments, but do not submit to Trump’s demands for border-wall funding. The standoff between Trump and Pelosi comes as the House and Senate are taking contrasting paths on legislation aimed at reopening government while hundreds of thousands of federal workers face a second missed paycheck at the end of the week. Meanwhile, some members of Congress are also refusing their paychecks in a show of solidarity. So far, 102 members of Congress say they will turn down their paychecks during the partial government shutdown, according to social media posts. That comprises of 20 senators and 82 representatives, with members from both parties making up a similar proportion of those going without pay. In United States politics, a government shutdown occurs when Congress fails to pass sufficient appropriation bills or continuing resolutions to fund federal government operations and agencies, or when the President refuses to sign such bills or resolutions into law. With no end in sight, this is the longest government shutdown in history at 33 days long.